Guten Tag! (Good Day!) I'm trying to learn some basic German phrases, because next month I will be vacationing in beautiful Germany!! I am so excited about this trip. I haven't been to Europe since before I had kids, and I have never been to Germany. I will be traveling with my brother and my 12 year old son. My brother was planning to travel there by himself, and my husband suggested (apparently, in a moment of temporary insanity) that I join him. It felt strange to take a vacation without any of my boys, so I invited my two oldest sons to join me. The 12 year old jumped at the chance. The 11 year old was lukewarm. He thought going to a lake house in New Hampshire with my sister's family sounded more appealing. My pocketbook agreed. So, it will be a nice opportunity for some bonding time with my middle schooler. And, traveling with my brother makes it easy for us. He speaks some German, is a total history buff, and is well-traveled. We couldn't ask for a better travel guide/companion. Have you been to Germany? Any suggestions on things to see and do or places to dine? Would love to get your recommendations! Oh Carolyn!! I am so jealous! I love Germany and lived there for 2 1/2 years! I lived very close to Strasbourg near Baden Baden in a tiny German village called Ottersweier. Oh how I miss it! Off the top of my head, I loved the Check Point Charlie Museum in Berlin. Of course you have to walk along the wall and bring a chunk back. Berlin was pretty incredible. I only went to Munich for Oktoberfest so I am not a lot of help there! The Eagles Nest in Berchtesgaden is awesome as is Salt Mines. We were at the Eagle's Nest and I said, "Look how close that cloud is!" The next minute we were in the cloud and you couldn't see a thing around you! That is how high up you are! Nuremberg is incredible. I love the tours through the underground tunnels and the Nazi Museum was amazing. I learned so much there! Strasbourg is just a lovely city to eat in and wander. The cathedral is gorgeous and has a unique astronomical clock. In Strasbourg, you have to eat Flammkuchen (the French word is Tarte Flambe)! It is unleavened pizza crust with Crème fraîche, onions, bacon or ham and cheese baked in a stone oven! Oh divine!!! Feel free to email me with any questions! Oh, I envy you! You are going to have such a great time! We sent our boys to Cologne to stay with our friends when they were 12 and 13. They weren't too thrilled. To this day they groan when we bring up the subject of visiting these friends! I guess that's not what you want to hear! lol! Keep us posted!! Wonderful. I currently live in Germany. I live close to Nuremberg and Munich so I go there often. Both great places to visit. There was a huge flea market in Nuremberg last week that I blogged about. 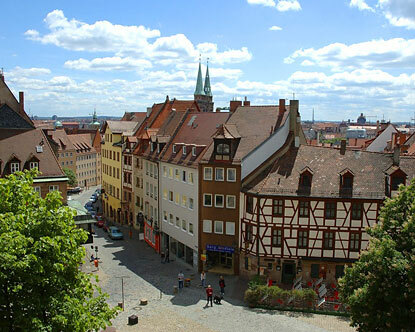 Nuremberg has lots of historical places to visit. Munich is great. I would visit the Residenz Munich. They have the most beautiful decor inside and many of the decorations are by Kind Ludwig II who lived in the Neuschwanstein and Hohenschwangau castle. Speaking of which, you should definitely see those two castles, I blogged about them as well. Let me know if you need any more info. Ha! My comfort shoe order from the Walking Company arrived today - I'll show you mine if you show me yours . . . I lived with a family in Strasbourg when I was an exchange student in HS and have such great memories of that city. You'll love it! Well, I'm probably writing this comment while you're in Germany (I just discovered your lovely blog!) but I'm offering a couple of small tidbits anyway. My husband travels to Germany several times a year on business and I have been fortunate to accompany him. The people are extremely nice and the country is beautiful! In the major cities it is easy to find people who speak English. I have toured by myself when my husband is working and I have had no problems getting around. I have toured mainly Frankfurt, Heidelberg, and the wine country and have enjoyed it all. Have a great time on your trip!